Norcold Heater AC 225W/110VAC. Fits these models: 1210ACIM, 1210ACIMSSD, 1210ACSS, 1210ACIMD, 1210, 1210BK, 1210IM, 1210IMBK, 1210IMBKD, 1210IMD, 1210IMPFS, 1210IMSS, 1210IMSSD, 1210SS, 1211IM, 1211IMSS, 1211IMWPM, 1211WPM, 1200ACIMSS, 1200LRIMSSD. *note that this is the newer style AC Heating Element. If your Cooling Unit serial number is below 11231146, you need AC Heater 618872. Click the link to the left to view that product. 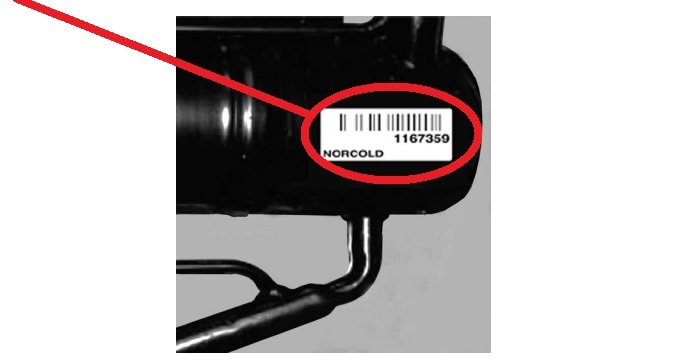 *The cooling unit serial number can be found on the cooling unit itself. Remove the rear side panel on the outside of your RV to access the back of the refrigerator.